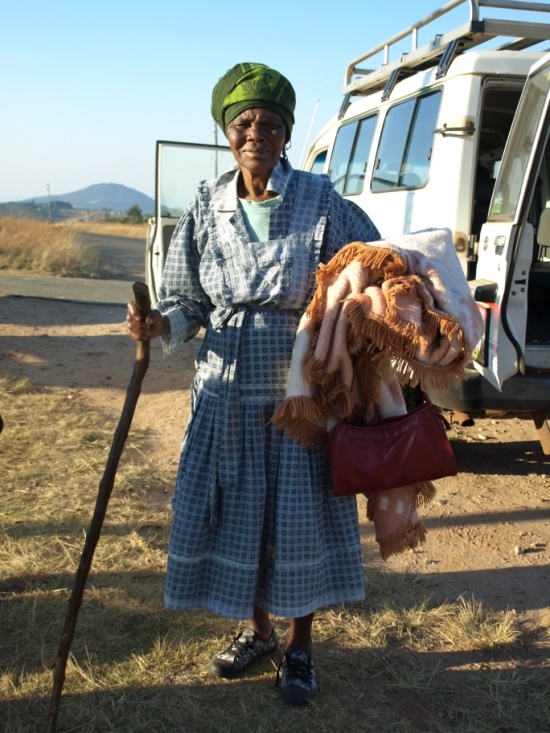 The Ebenezer Clinic is a rural clinic 15km up the bumpy road from Good Shepherd Hospital. It was originally built around 1910 by missionaries of the church who wanted to serve the medical and spiritual needs of the local community. In 1998, the Ministry of Health decided to shut down the clinic due to roof leakages, no toilet facilities, no water and no electricity. Pastor Vuyiswa Precious Mazibuko, a retired school teacher, decided to use all of her retirement fund to renovate the clinic. After acquiring some medicines, a few chairs and tables, Ebenezer clinic was reopened in June 2013. Two lovely nurses, Irma and Thula, were employed and work from Monday to Friday. Every Wednesday, the elective medical students from Good Shepherd visit the clinic to help the nurses with their daily work. Right now the major problem is that the clinic is still waiting for financial support from the government. Until then, there is not enough money to fund the running of the clinic. The nurses have not yet received any income and there is no money to buy medical equipment and furniture that is desperately needed. Precious fears that the clinic may have to close if no help is given. She worries that without the Ebenezer clinic the health of the local community will be neglected. See our video gallery for a detailed overview about this wonderful clinic. Finding employment in rural southern Africa can be very challenging for any young Swaziland resident. With an unemployment rate of 40% and 69% of the population below the poverty line, many Swaziland residents cannot even afford the bus fare into town. With no source of income, the only way to feed your family is to grow food at home. However, suffering from vision loss will greatly complicate an already difficult life. The traditional Swazi belief is that blindness is a curse, and that the affected are being punished for their sins. Some community members may be uncooperative, avoiding contact with the entire family. This was the reality for Sifiso, a resident of Siteki, and is a very bumpy 30 minute drive from the Good Shepherd Hospital. But only a few days ago, Sifiso's has begun a career as his area's local candle-maker! Sifiso's mother has been bringing in her two sons to see Dr. Pons since the early days of the eye clinic. Sadly, Both he and his brother Beggi have had vision loss since birth, and despite the clinic's best efforts, suffers from severe visual impairment (less than 5/60 visual acuity). When Sifiso was a young boy, he started school at St. Joseph's school for the disabled, a 100 year old Christian mission. Under the supervision of Sister Stephani, these students take classes including math, Braille and English. In addition, they also learn practical skills such as candle-making and fence-wiring. 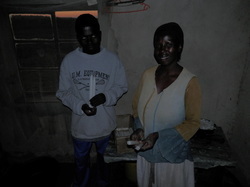 Sifiso became very competent at making candles, which is the most common source of light in his community. Once he graduated from school last year, Sifiso has been struggling find work from home, where employment opportunities are already very limited. When he visited us for a check-up this year, he has been struggling to keep busy and help maintain his household. Yet, if he had a source of income, he will be able to contribute greatly to his family. This is why the Good Shepherd Eye Clinic decided to buy a candle making press for the young man, a life changing purchase far beyond Sifiso's reach. With the help of Sister Stephani, we have been able to hire the same engineers to manufacture a press similar to the one that Sifiso had learnt to make candles at St. Josephs. The process to create the simple white candles involve simple tools with the solid steel press, so Sifiso will be able to make an income from his production for years to come. 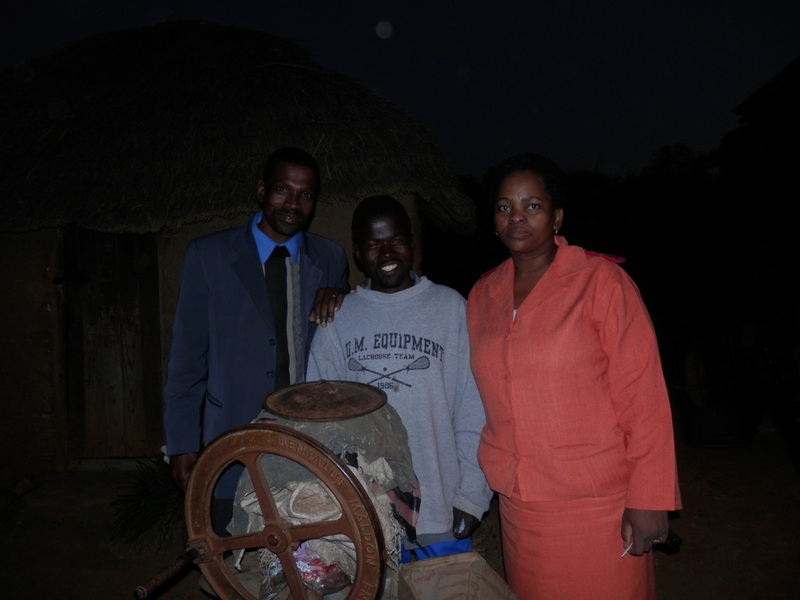 After the initial gift of 10 kg of wax, Sifiso can use his profits to purchase more supplies and sustain his production. It will be a very challenging time for Sifiso; starting off as a young entrepreneur is a daunting task in any country. In addition to the new income that he will bring to his mother and brother, Sifiso role in his rural community will dramatically change. With a practical and essential skill that he can provide for his neighbours, the acceptance of his and his younger brother's disability comes hand in hand. We are glad to play a role in this family's life, and we pray that Sifiso's new enterprise will be a shining light in his community! Thanks again to the international team for all your hard work and incredible effort to help make this dream a reality. We look forward to using the lasers! The Good Shepherd Hospital Eye Clinic would like to send a big thank you to Dr. Matthew Tennant of Edmonton, Alberta, Canada for his generous donation of a retinal camera. This new piece of equipment will allow us to make great strides in understanding and tackling the problem of diabetic retinopathy. We are so thankful for this piece of equipment and for the support of donors like Dr. Tennant whose continued support allows us to provide world-class eye care to the people of Swaziland. The Good Shepherd Hospital Eye Clinic would like to say a big thank you to the Manzini Lions Club for their E20,000 grant! Their contribution will help to provide life changing surgery and restore sight to some of the poorest people in the world. CBM supplies finally arrived in the hospital today: We are unpacking the boxes that contain enough supplies for a year of cataract surgery in Swaziland. Thank you CBM! "Doctor" he mumbled, with his chin firmly in the slit lamp chin-rest, "The room seems to be filling with smoke" mumbled again as I hammered away at his retina with significant joules of Argon laser energy. "Really?" says I with clenched teeth, hoping the old laser wouldn't give that wretched "Overheat" alarm signal again. I look up from my concentration on the temporal retinal artery and sure enough, there is a haze from door height up, the smell of burning electrical components. And as you know, where there's smoke..... So that's how the last laser machine died in October last year. The old 1980's unit at Good Shepherd had died first, followed by the newer (ex Moorfield eye hospital) laser described above, based at the clinic in Manzini. The last 6 months have seen many people sent away with diabetes retinopathy raging like out of control forest fires. And there's not much else but Argon laser that works. Armed with no laser experience yet enough enthusiasm and faith, Terry and Dan got stuck into the broken lasers today. These are 2 friends extraordinaire from White River. (South Africa) Both are American missionaries and Terry has helped me with fix-it jobs in the clinic before. We met when he needed my professional help some years ago. The prognosis on the old laser doesn't look good. Does anyone know how to fix Error Codes 110, 111 and 112? Well, they failed so lets leave that old machine to be sunk in a lake. So, on to the "smoker": After much searching for we know not what, suddenly Terry notices a circuit board with a burned out Capacitor and some oily stuff extruding. I'm sent to find a replacement. In Siteki? A town of dusty streets and simple needs? Thank God my paths led me to Raymond and thus to the TV repair shop. After a few minutes, he comes out of the TV graveyard with a "cap" that is vaguely similar. And what do you think happened? It works! Perfectly. Thank God. Thank you Terry and Dan! So the big need of 2012 is already met. Roll on the rest of the year! Welcome to 2012 with all the challenges ahead! I returned from a wonderful 3 weeks with my young family on holiday at the beach in Southern Cape (RSA) We enjoyed sun, waves, Cape scenery and family time. Though a very long drive (20 hours!) it was all worth while. We ended the holiday settling the 4 children into their university/schools. 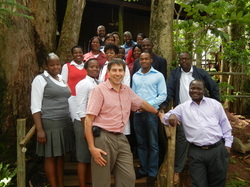 Swaziland is in a deep financial crisis and this extends to the provision of health services. We thank God that the eye service is unheeded in it's vision to provide excellent care across the country. We're praying that our ability to do this will be sustained! CBM have given us a budget to do free surgeries in 2012: We're so grateful to our CBM friends in Canada who make all this possible! Also, we're eagerly awaiting a consignment of drugs and materials supplied by CBM: Currently waiting for all the import documents, but once released, they will be pressed into action! The focus of the Eye service has expanded to include training in Ophthalmology. Once Dr Brady left us, there were at least 8 other international medical students we taught. Late last year Dr Shaer from Scotland arrived for an into into Ophthalmology and she had a wonderful month of learning eyes. I learned from her much about frogs - of all things! Yes, we crept around ponds in the night and saw the most wonderful creatures! I had hoped to have a doctor from RSA to train this year but unfortunately that has not materialised. I'm quite confident that we will have trainees later this year: It's become like breathing to have a trainee ar0und. The big challenge is to find a replacement for the the Argon laser we have lost. See elsewhere for more details of our needs. Wishing you the best for 2012!